In case you haven't noticed the recent feline inspired theme on our Instagram posts and gift guides, we are definitely unabashed cat people. 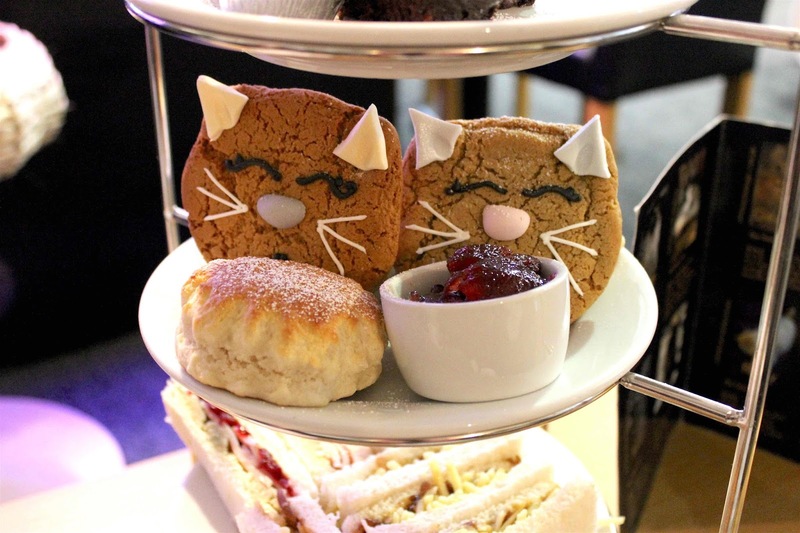 So when we heard about Cat Cafe Manchester's new Christmas afternoon tea we couldn't wait to give it a try! Our first tip would be to book ahead. 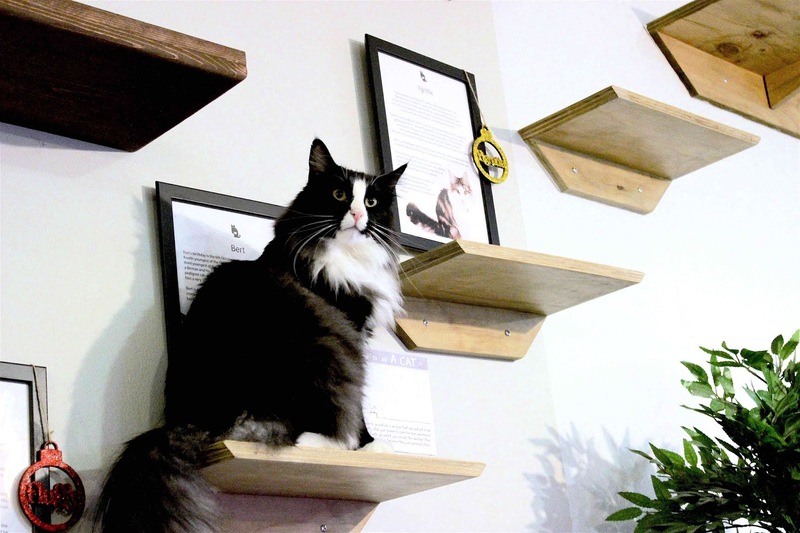 The cafe only allows a small number of visitors inside at any one time (as not to overcrowd the cats!) and there was a hefty queue of people waiting to go in when we arrived on Sunday afternoon. 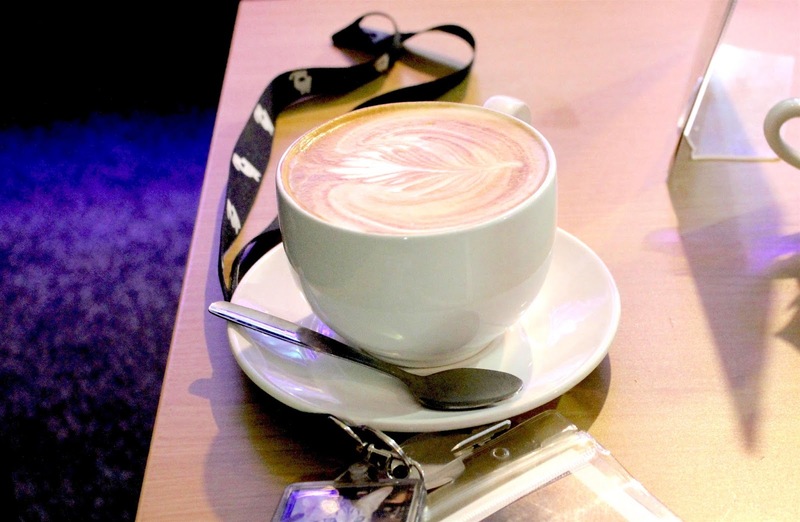 £12 will get you an hour of kittie time with all hot and cold drinks included plus £1 for every additional 5 minutes spent in the cafe. Afternoon tea is priced separately at £8pp. The cafe itself feels like you've stepped into someone's living room/ pet shop, spaciously kitted out with comfy sofas, cushions and enough tunnels, bridges and boxes to keep the stars of the show entertained all day. 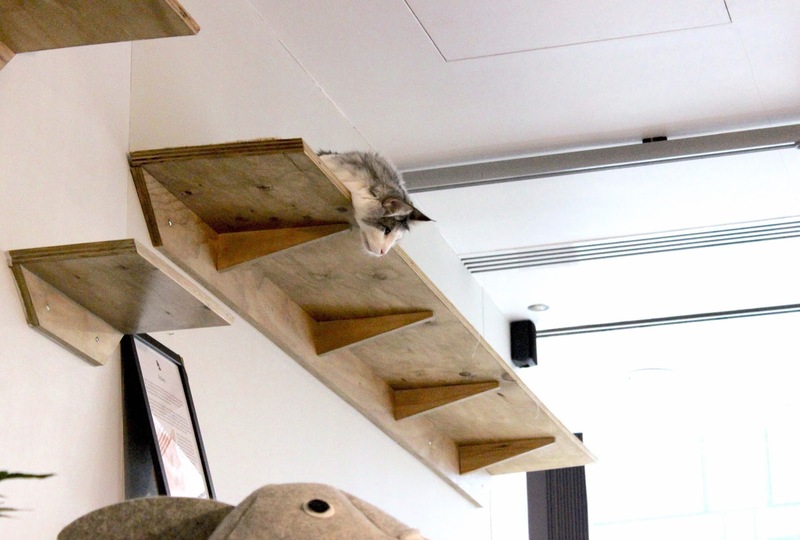 Upon arrival we spotted a few cats hidden away on high shelves and curled up sleeping by the counter complete with a 'do not disturb' sign and completely unfazed by their adoring fans - truly, cats after our own hearts! 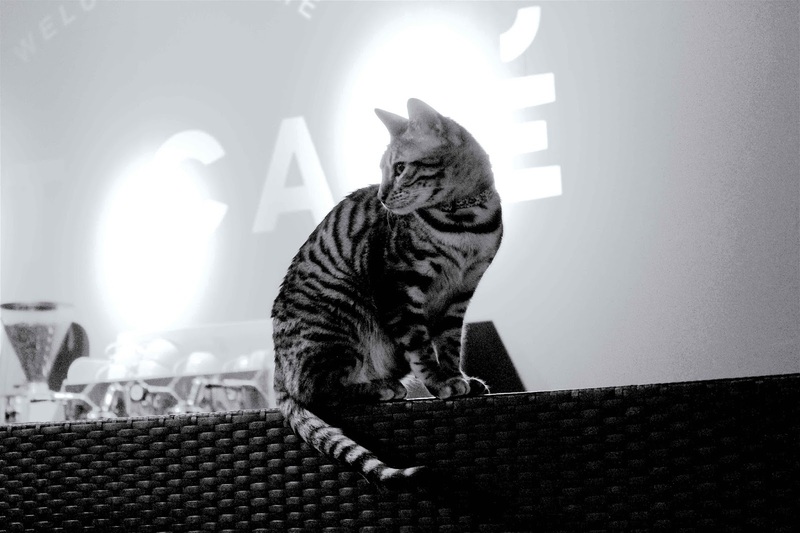 Drinks are ordered over the counter where you will find a selection of cat-inspired cakes and tray bakes to choose from. We opted for breakfast tea and a latte before indulging in hot chocolate generously topped with marshmallows and cream a little later on. 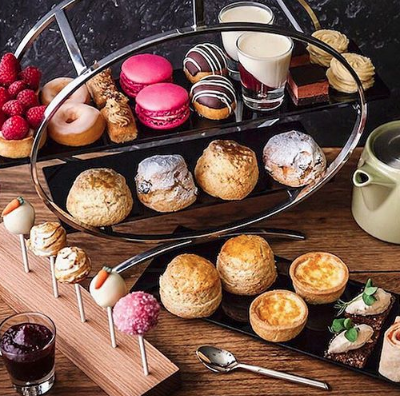 Afternoon tea comes with two types of finger sandwiches; turkey, stuffing and cranberry sauce, and cheese and chutney. There are four of each, it would have been good to have maybe one one more option in there to add a bit of variation but nonetheless, good stodgy fillings and perfectly fresh. The scones were good too, though shop bought as no hot food is prepared on site, they were very tasty and served with a good dollop of jam and cream. 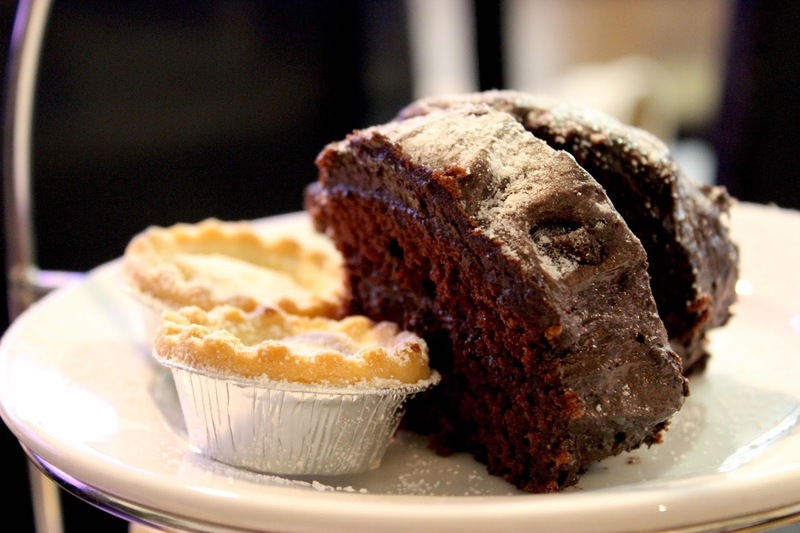 To finish we tucked into slices of chocolate yule log, mini mince pies and two super cute gingerbread cat cookies. A really sweet mix of treats and just enough to leave us feeling full. Later on, as though unleashed to the public (or paparazzi due to the entire cafe clamouring to take photos), more cats appeared from behind the counter ready to play. If we could have taken them all home, we would have definitely left with meowing pockets and handbags. It looks super cute. I walk past this a lot thinking "don't tap the window!" The last bit sounds like"release the hounds" but with cats. A sweet, furry nightmare.